Born in Sapporo, in 1965. Studied at TOKYO SCIENCE UNIVERSITY in chemistry dept. 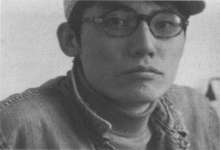 Began making film works since 1985. Many of the 90 films were produced on Super-8 and 16mm film. Now living as a film maker in Tokyo and co-founder of the " FilmMakers Information Center (FMIC) " experimental film/video group, which has curated and presented the several screening events of the independent film-maker's works in Japan since 2002 to 2006. Currently teaching film-making at ASAGAYA COLLEGE of Art & Design and also teaching hand-developing workshops at other art school or art gallery.